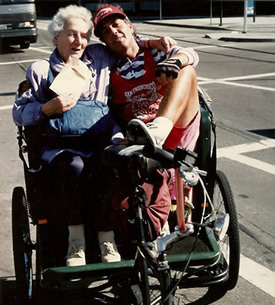 Pedicabs first appeared in San Francisco in 1980 when Jeff and Helena Sears started Barbary Coast Pedicab with 8 cabs. They operated in and around Fisherman's Wharf and Chinatown, where they faced concern by area merchants who were always skeptical of any new player in the tourist-rich neighborhoods. Despite the opposition from some groups, their business became one of the most enjoyable attractions in San Francisco, and they continued to grow. Pedicab drivers came from all walks of life and from all corners of the world. They were a colorful and eccentric bunch. Many had pedicabbed in other U.S. cities or countries. It provided a great summer job for some, and an adventurous alternative lifestyle for others who would move from city to city, riding a pedicab wherever they landed. 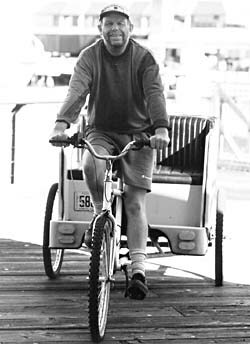 As they gained popularity, more pedicabs began to operate along the wharf. Some were part of organized groups, while others were just individuals showing up with their pedicabs for the day. With no rules or regulations at the time, it was hard to control to the quality of the industry. Disputes between pedicab companies and/or drivers weren't easily resolved due to the lack of proper laws. Organized companies such as Barbary Coast were concerned that some of the rogue pedicab drivers were threatening the industry by giving it a bad reputation. The local merchants weren't any more accepting of pedicabs either. Some of them called the cabs tacky. In 1985, when asked about pedicabs, the president of the Fisherman's Wharf Merchants Association, Chris Martin, said, "I'm not proud of the honky-tonk you see in the area already." But the public appeal for pedicabs was strongly evident by the increasing number of fares. People enjoyed the open air experience and driver interaction that a pedicab ride provided, and it was quickly becoming one of the many awesome things to do in San Francisco. By the mid 1980s there were over 50 pedicabs operating in San Francisco. The industry had shown that it had a strong demand, but it was still suffering growing pains. Some wharf merchants and city officials still complained about pedicabs. The Sears' were frustrated that the reputation of the industry was being tarnished, and some of the rogue companies and drivers were making matters worse. One of these companies, Artie Shaw Rickshaws, was known for their Thai style rickshaws driven by some of San Francisco's flower children. They were colorful and hip, but would eventually get booted from their Port lease after complaints of illegal activities and rumored ties to the Hells Angels. As the unregulated pedicab scene continued, the organized companies decided to make a strong push for more Port regulation to protect the quality of the industry. In the early 90s, there were two pedicab companies operating in The City: Barbary Coast and Rama. They fought to gain acceptance from the S.F. Port Commission. They wanted to be recognized as legitimate Port businesses and establish a set of pedicab regulations to prevent rogue drivers from damaging the image of San Francisco pedicabs. They also lobbied for legal pedicab parking zones. At the time, drivers were often hassled and/or ticketed for parking along yellow curbs. There was no place a pedicab could legally stop and wait for a fare in the Wharf or along The Embarcadero. The two companies and their drivers campaigned hard for the cause. They took the issue to the 5 member Port Commission, and then Supervisor Angela Alioto. In 1992, on the day of the hearing, dozens of drivers filled the court room to show support for pedicabs and their livelihoods. In a 3-0 decision (2 absent), the Port Commission granted pedicabs a three month trial of official pedicab parking zones. One zone was at the Ferry Building, and the other was inside Fisherman's Wharf at Pier 41. This was a major victory for the pedicab companies. The ruling not only further legitimized their operations, but also was a turning point towards a more friendly relationship with Port and city officials. The three month trial would go on to be made permanent. The mid-late 90s were a great time for pedicabs in S.F. as the they gained legitimacy and benefited from a booming dot-com economy. Although Rama Pedicab ended business in 1996, Barbary Coast kept going strong. The unlicensed companies and drivers were now gone due to the new regulations. By the year 2000 though, the dot-com bust had arrived, and Sears decided to sell almost all of his pedicabs to a company in New York. Pedicabs all but came to a halt in San Francisco. There was a driver named Craig Nairn who had purchased 5 cabs, and for a moment, his cabs, along with two licensed independent operators, were the only pedicabs on S.F. 's streets. A handful of drivers shared Craig's cabs as they struggled to keep the San Francisco pedicab scene alive, but soon Craig would end up selling his pedicabs as well, leaving only a couple of independent drivers left. Keith Saggers, who had worked on and off for Sears since 1982, was one of the licensed independent operators. 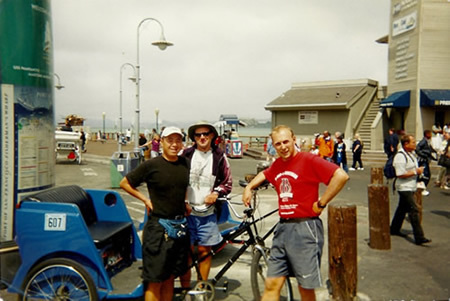 He purchased his first pedicab from Sears in 1992, and then in March of 2001 he purchased the remaining 3 pedicabs that were left over from Barbary Coast. With these 4 pedicabs, and 10 other cab frames that came with the deal, Saggers carried on the legacy of the original San Francisco pedicab company, and pioneered what is now San Francisco Pedicab -- or Keith's Pedicabs. The early 2000s continued to be a rough time for pedicabs in The City. The lingering effects of the dot-com bust, along with the tragic and economic crushing events of 9/11 left the lone company struggling to survive. By 2004, business was getting back to normal, and a new company named Electric Time put 6 pedicabs on the street. San Francisco Pedicab and Electric Time shared the roads until 2006, when Electric Time decided to get out of the business. From that time on, it was one lone individually licensed driver, and SF Pedicab's 15 cabs which were the only pedicabs operating in The City. Public support for pedicabs continued to grow even though the number of cabs on the street was declining. Pedicabs provide green transportation, they are able to navigate through traffic jams, riders enjoy open air views, and they are downright fun! Despite a bump in the road during the 2008 economic slump, pedicabs continued to grow in popularity in San Francisco and elsewhere. In 2010, national pedicab chain Coaster Pedicab, Inc. opened up shop in San Francisco as Golden Gate Pedicab, and in 2011, one of their former drivers would go on to start his own pedicab company, Cabrio Taxi. The three companies, along with one individually licensed driver, are presently the only pedicabs operating in The City. Today San Francisco Pedicab upholds the S.F. spirit with a diverse fleet of 20 colorful and customized pedicabs. Our fun and knowledgeable drivers still serve all the traditional tourist attractions in San Francisco, as well as Giants games and other events at AT&T Park. Kids and adults alike can't help but smile when it's pedicab time. Pedicabs are more than just transportation -- they're entertainment!